Drawing a tic tac toe board and playing with a friend is a great way to entertain yourself during those slow minutes. Or as a kid, you just want to try and win the game, one more time. 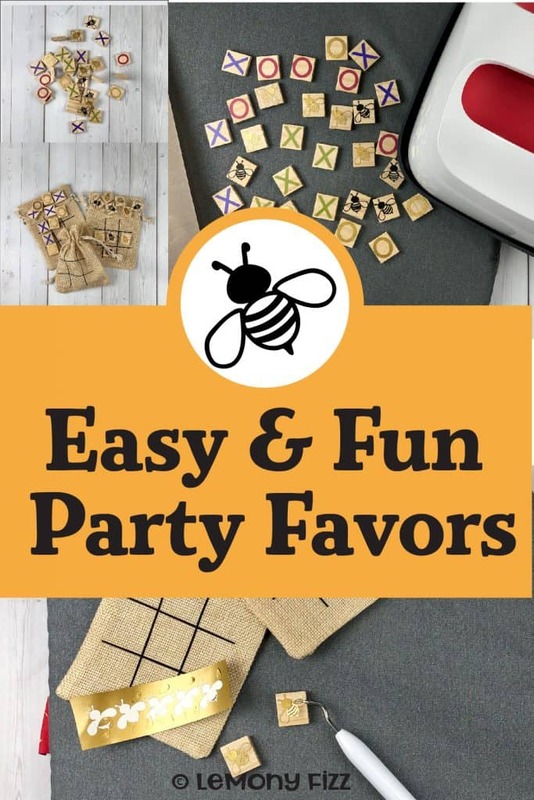 Now you can make a version of this classic game and give it away as party favors, door prizes, hostess gifts and more. 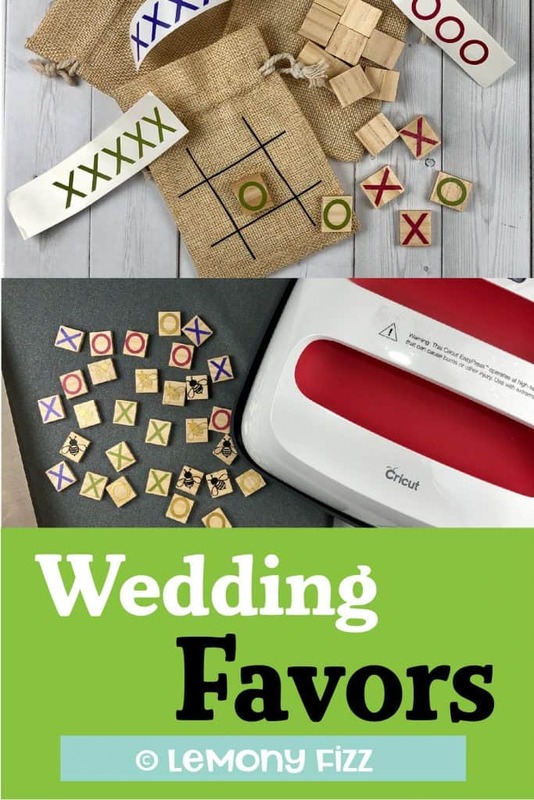 Follow this quick and easy tutorial to learn how to make your own tic tac toe board and packaging using inexpensive materials and your Cricut cutting machine. 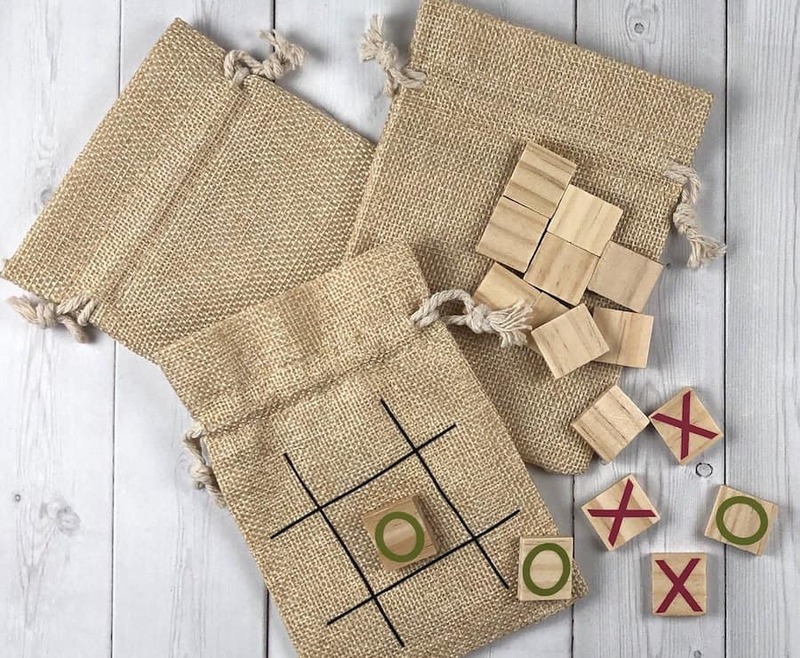 I purchased the burlap bags and wooden tile squares on Amazon. You can probably find them at your local craft store as well. Ready to Make Some Party Favors? These are classic and shabby chic at the same time. You can add your own touch of creativity by changing the images on the tiles (no one says you have to use “x’s and o’s”). I made a set with bumble bees and they just make me smile when I look at them! Use the pattern in the member’s only library to cut out your X’s and O’s and the lines for the bag. It also includes the bees if you want to try those too. 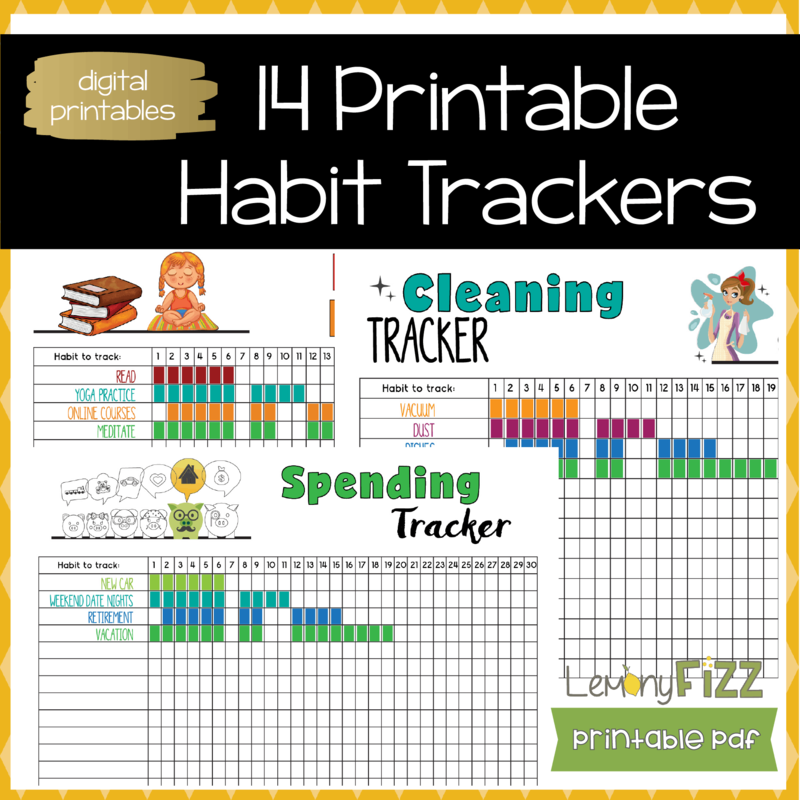 Psst: If you aren’t a member yet you can fill out this form and get the password delivered to your inbox while you finish reading this tutorial. Cut out the shapes on vinyl and iron on vinyl. 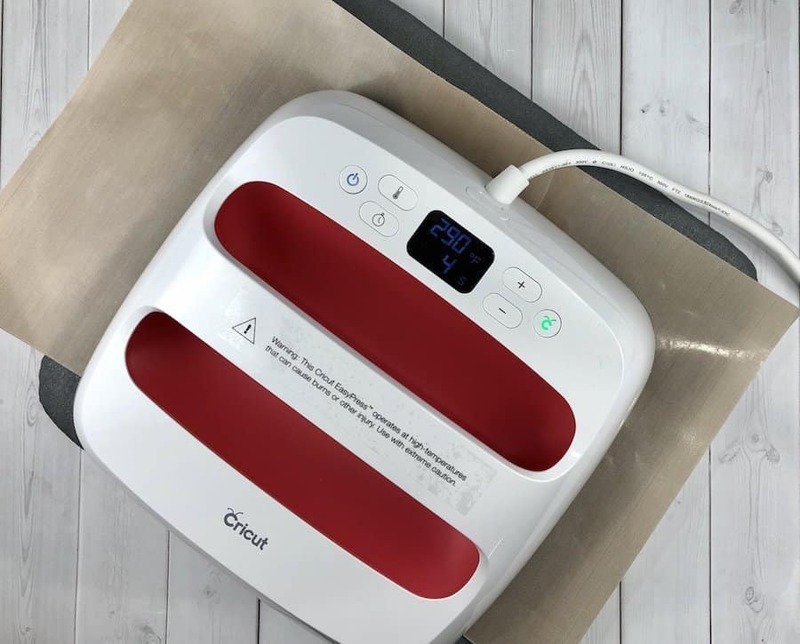 You can use the iron on vinyl with the wood tiles or use regular vinyl and then warm it up a little with the heat press set at a lower heat. Set your heat press to 290 degrees and set the timer between 30-45 seconds. I used a sheet of Teflon between by press and the burlap because I wasn’t 100% sure what materials it was made from. I didn’t want it melting onto my machine. TIP: scoot the burlap and the Teflon to your press area. Place the edge of the heat press or iron on the bottom edge of the thick area of the top of the bag. This lets your iron sit a little flatter on the bag and you get a better press on the iron on vinyl. 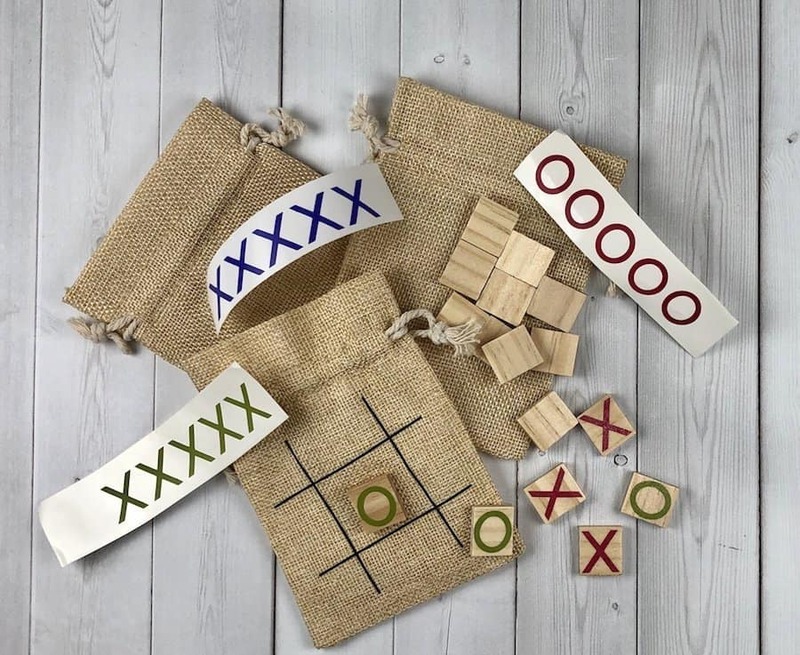 Once you have all the tic tac toe boards set on your burlap bags, turn the heat down on your press to it’s lowest setting (the Cricut Heat Press goes as low as 210 degrees). Place all your chosen designs on your tiles. I chose to print my tic tac toe pieces in two different colors. 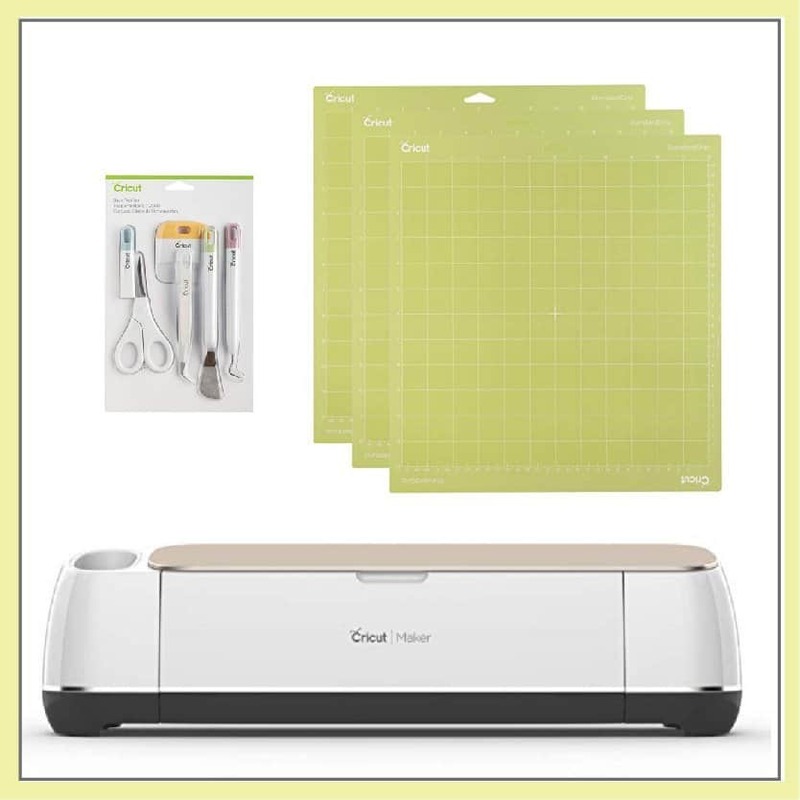 You could also choose two different images and then print them all in the same color. 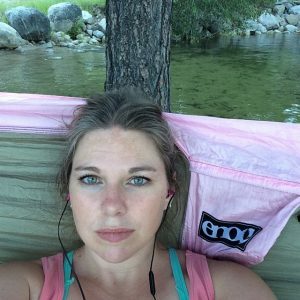 This all depends on your supplies and the style you are going for with your project. You could also think outside the box and change up the board shape (think hexagons for the honeybee pieces!! or flowers for butterflies…so much fun!). 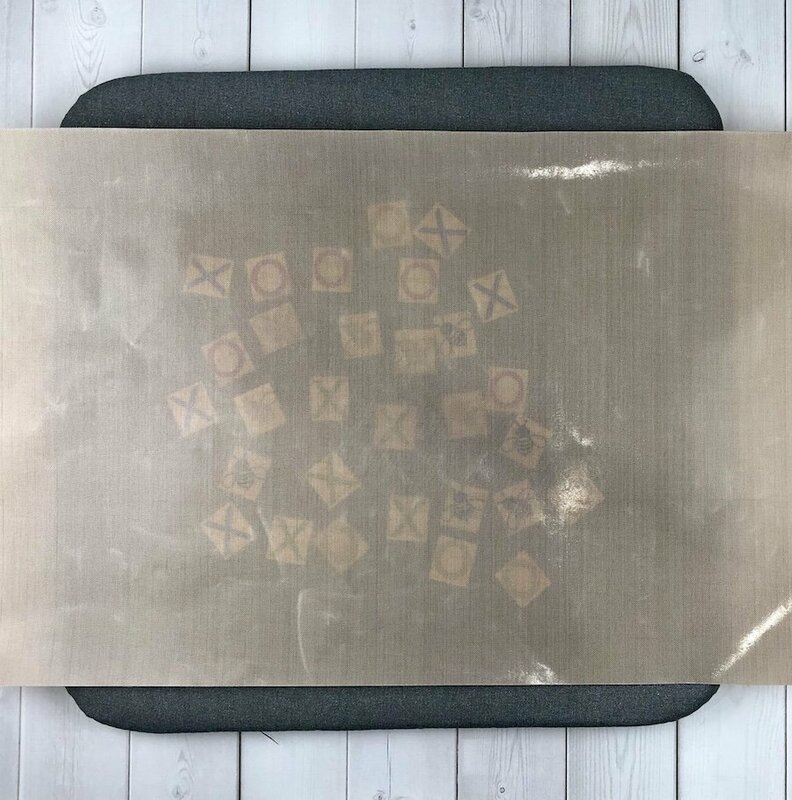 Once you have all your tiles decorated with their vinyl shapes, put them on your heat press pad and cover them with the sheet of Teflon. If you are using regular vinyl, press them for about 15 to 20 seconds. This will melt the vinyl in a little onto the wooden tile. The heat helps set the adhesive and make it a little more permanent. 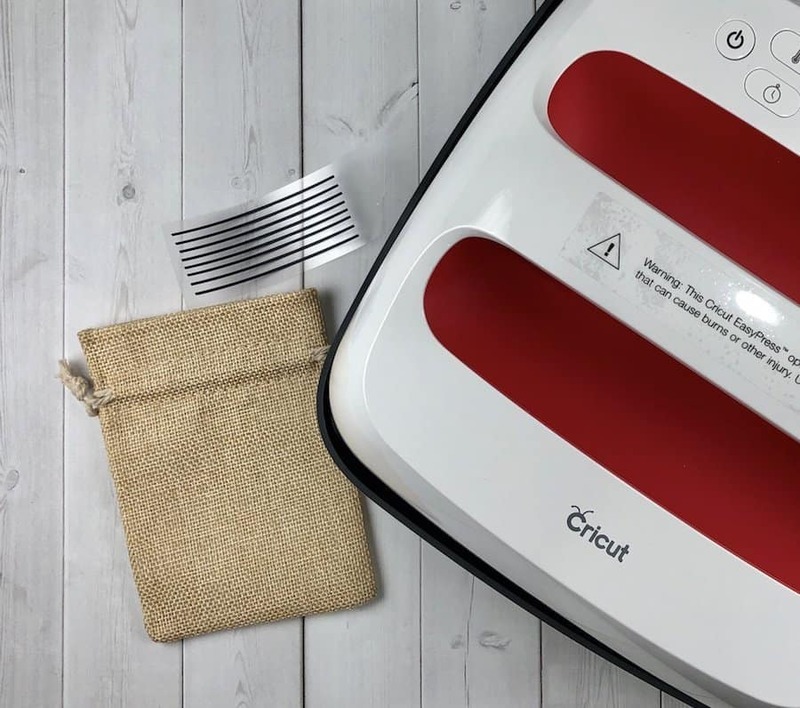 If you are using regular heat transfer vinyl then you will want to leave your iron set at 290 degrees and use that to press your pieces. I would still cover with the Teflon piece to protect the wood of your tiles. 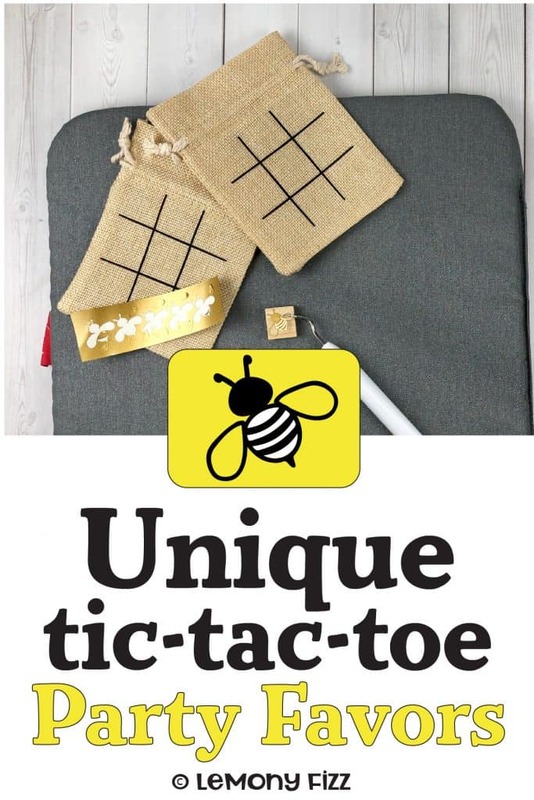 Place all the pieces for your tic tac toe game inside the bag and add a tag or ribbon. Share and have fun playing this classic game in a new and fresh way. 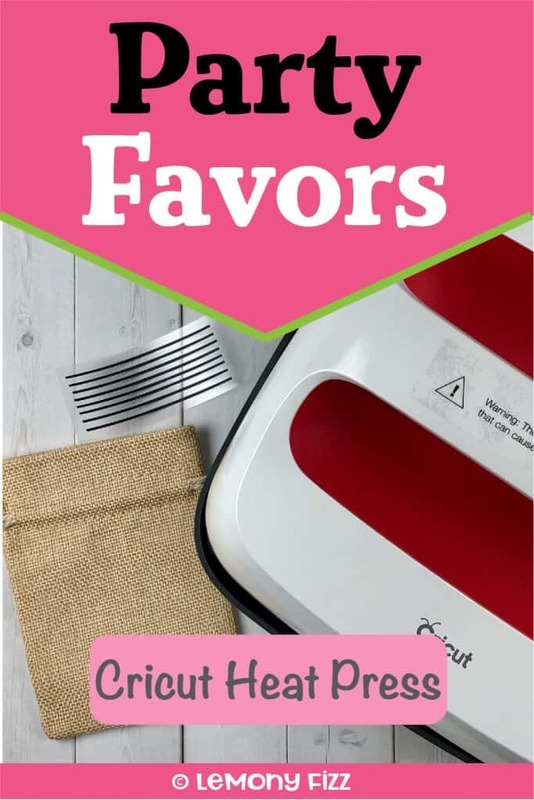 Wedding Favors, Hostess Gifts, and MORE! 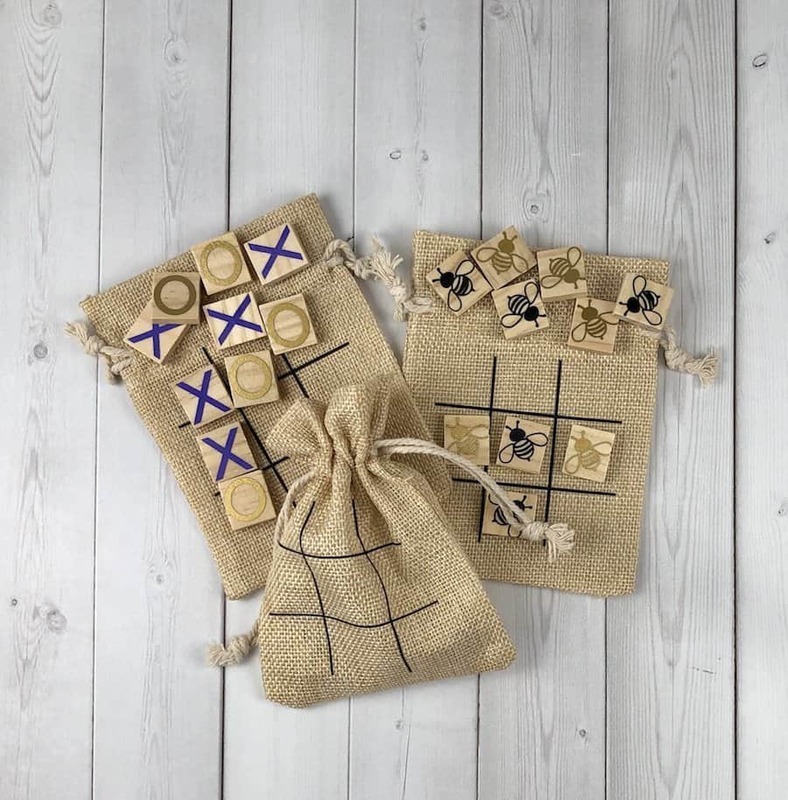 Whether you are making these as wedding favors to help entertain kids during your wedding reception, as a birthday party favor, or a hostess gift, these little tic tac toe boards are sure to please. They are very inexpensive to make and they don’t take long to assemble. 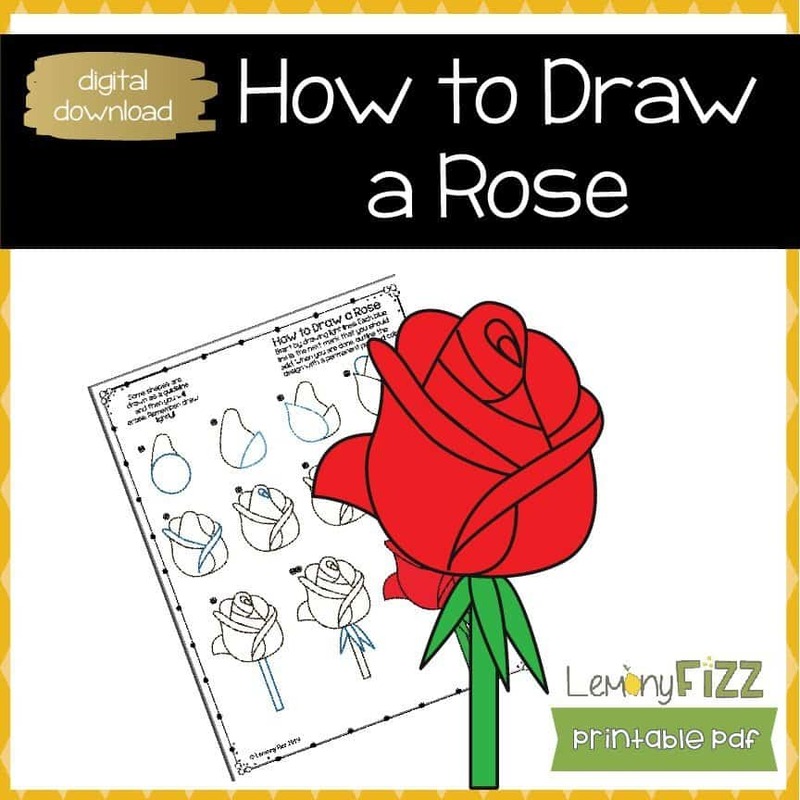 Feel free to share your completed project on social media with the hashtag #LemonyFizzCrafts. I’d be happy to reshare it and spread the creative love. Want to remember this? 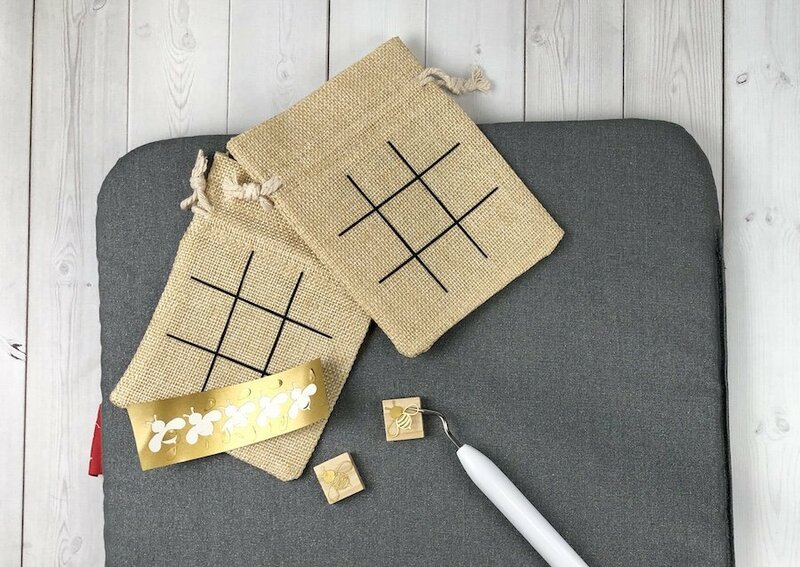 Post this Tic Tac Toe Board Party Favor to your favorite Pinterest board!